Citizen Advocate is a non-partisan system bridging the gap between citizen and representative. Groups of citizens come together and support a like-minded advocate, who lobbies on their behalf. Advocates educate their citizens to increase their political literacy, and also give citizens a channel to express their frustrations. Average citizens are under-represented in government today, and trending towards decreased representation. Money is flowing into democratic systems at an increasing rate. Lobbying on behalf of corporations and economic elites has a 'substantial' impact, while average citizens and their groups have 'little or no' influence [ref.]. Spending on lobbying is estimated at $10 billion per year [ref. ], which is approximately $2.50 per month per citizen. By creating a grassroots lobby for citizens, we can balance the influence on politicians. In today's world it's a full time job to be informed on any number of specialist topics. Most citizens already have a full time job, and only have enough time to keep their finger on the pulse of the issues they are passionate about. Furthermore, trust in institutions and experts is eroding, and many citizens no longer trust those from different backgrounds. Citizen Advocate hopes to put each citizen in touch with someone trusted and knowledgeable they can communicate with and bring their questions to. These advocates would not necessarily have specialized backgrounds or educations, but would have the time to be fully informed about the issues of the day. If fully realized, Citizen Advocate would employ 300,000 citizens to increase civic literacy across the nation. - A public lobby. Advocates would develop relationships with elected representatives, and help guide their votes towards the needs of their constituents. - A general purpose union. With enough engaged individuals, union strikes could be augmented with organized boycotts to assist with collective bargaining. - An organized voting block. Advocates would encourage their citizens to vote, and could provide recommendations on who to vote for. - As a fresh source of trusted information. Members of the same group would get to know each other and their advocate. With growing trust in a knowledgeable advocate, citizens would be less prone to wild conspiracy and less vulnerable to misinformation. Citizens pay $9 per month with the proceeds going towards their advocates. Advocates are paid according to the median household income of the United States citizen ($60,000 at first.) Advocates work full time to address the needs of their community, lobby on their behalf, and generally stay informed on a local and national level. Q. How are groups formed and dissolved? A. Advocates enter themselves and their bio into a list of available advocates, complete with their current citizen count. 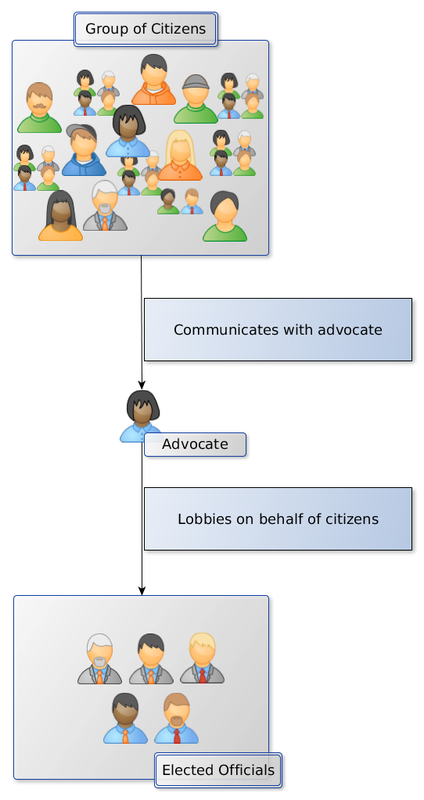 Citizens, when joining, are able to select the advocate they feel will be most responsive. Citizens are not locked into contracts, and can withdraw support for their advocate for any reason. A. No, we will be welcoming citizens and advocates of any political party. Trust in politics is at an all time low. By allowing citizens to nominate someone like themselves, they will have more trust in this person. As the advocate becomes able to spend their time educating themselves, it is highly likely they become more moderate. Q. What if they take money from special interest groups? A. It will not be required for advocates to publish their financials, but it may be common practice to have them audited. Because there are no terms, the results of a scandal may be particularly harmful to an advocate, as they may loose their entire constituency overnight. There may be significantly more risk and less reward for an advocate to engage in pay-for-play practices than there is for current representatives. Q. Why are group sizes limited? A. Groups are limited in size to make life easier on the advocates, and to make community and consensus building easier. A smaller group size may be better, but it needs to be balanced with monthly cost per citizen. Q. Can I join multiple groups? A. No. Citizen Advocate is an attempt to reduce the influence of money in politics. If one allows membership in multiple groups, or citizens to pay more for smaller groups, we reduce the equality of each citizen's voice. Remember that idea of one citizen one vote? You know, democracy and equality, those principals we allegedly hold dear? Q. Is there any proprietary technology, like a website? A. Not currently, and there's no need initially. There are plenty of open source or off the shelf tools (like Patreon) capable of organizing people towards common goals. Until the market has clearly indicated that there is a demand for citizen voices in politics, it doesn't make sense to invest in such tools. Let others know you're rooting for Citizen Advocate's Success! Indicate you're ready to fully support the first Advocate, but want to wait until we have one. You'll be eligible to vote for the first citizen advocate. Be remembered forever as full supporters of the first citizen advocate. You'll be eligible to nominate and vote for the first citizen advocate. Start the nomination process! With enough incentive for an underemployed citizen to work their spare time, we can pick one out.